DES MOINES – Iowa Barnstormers Head Coach and Director of Football Operations John Gregory announced this morning that the Arena Football League team has reached agreement with Defensive Backs Alex Chandler and Nick Clement along with Wide Receiver DeNayne Dixon. 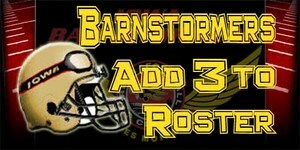 The Barnstormers now have four players under contract for the 2011 season. Chandler(6-1, 180) joins the Barnstormers after a solid four year career at Winston-Salem State University where he played from 2006-09. In 42 career games with the Rams, Chandler compiled 130 tackles and 7 interceptions. The Kingstree, SC native also spent time this spring in training camp with the Montreal Alouettes of the CFL before being released in June. Clement (6-0, 200) comes to Iowa after four seasons at North Carolina A&T State. In 44 career games from 2006-09 he tallied 180 tackles and 3 interceptions. Clement is known as one of the hardest hitters in the MEAC, justifying his nickname as “The Hit Stick”. The Arden, NC native was a high-school standout at Roberson High, where he was named to the All-Mountain Athletic Conference first team after collecting 102 tackles his senior year. Dixon(6-4, 255) joins the Barnstormers following an All-Star season with the Erie Storm (AIFA) in 2010. In nine games the wide receiver recorded 55 catches for 703 yards and 15 touchdowns along with four rushing touchdowns. He also led the team in scoring with 116 points and was second on the team in all-purpose yards. Dixon played his college ball at Edinboro University (PA) where he was named to the Valero Cactus Bowl in 2009, an All-Star game for Division II seniors. The free-agency signing period for the Arena Football League is underway. Expect more announcements from Coach Gregory and the Barnstormers in the coming days. Don’t forget that 2011 Iowa Barnstormers season tickets remain on sale for as low as $117.00 per seat! Enjoy all 9 home games from the same great seat beginning this March. Don’t miss a minute of the action this season. Call 515-633-2255 or visit www.theiowabarnstormers.com for more information.